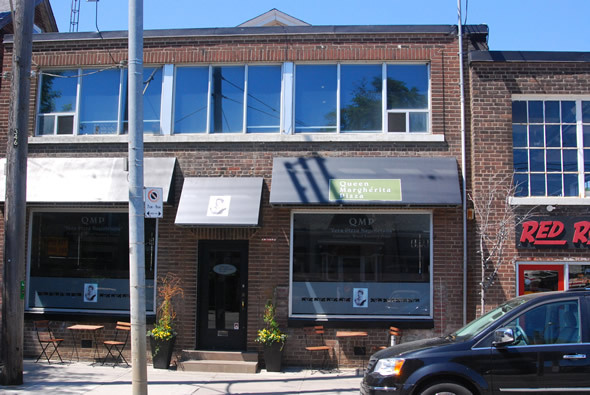 Queen Margherita Pizza recently opened in Leslieville and already it's being positioned as the east end's answer to Pizzeria Libretto . Yes, they too serve napoletana pizza baked in a prized wood-burning oven but as we know, even places that make the same type of food can offer drastically different takes on the same dish. And as much as I profess my LOVE for certain places and dishes, I can accept, for instance, there are those who think my favourite bowl of pho uses dishwater for broth. Once in a rare while though, you find establishments playing by the same rules-- sorta. That seems to be the case here. They're both all about VPN FTW! The fact that I wrote this site's doting Libretto profile last year, kinda qualified me for this particular gig and I was definitely curious to see how this two-month-old contender for the undisputed Toronto "vera pizza napoletana" crown measured up against, in your humble narrator's opinion, one of the best pies in the city. There are selfish motives for my visit as well: the prospect of some craft pizza a short walk from my front door! So, mindful that in order to get the VPN seal of approval you need to follow a certain standard, I was prepared to put aside my opinion and be objective for once. Sorta. QMP has been getting some decent press so I was expecting a crowd the Sunday afternoon I made my way over to the converted auto parts shop's eclectic space but to my surprise the Queen is dead with people opting for patio brunches and beach blankets this sunny midday. Proprietor John Chetti assures me the place is packed every weeknight and weekend evening but admits a patio would probably be as big of a draw as the pizza on a sunny day like this. "We're working on getting permission to put one out back" he admits, though he also acknowledges it probably won't be ready this summer. Unfazed, we settle into a seat on the brightly lit second floor with a full view of the imported Neapolitan oven manned by imported Neapolitan pizzaolos at the back, the ttc's Russellyard out front, and the menu under our noses. Since this is a pizza mission it's not a question of what so much as which one. The pizza options aren't as "flashy" as the ones at Libretto--no duck breast prosciutto on these pies--skewing more towards "traditional" combinations instead. After brief deliberation we settle on the Napolitana and the Diavola ($16.95 each a la carte) and literally 2 minutes after we place our order the pies arrive at our table hot on the heals of the two glasses of excellent chianti ($9.50 each) we order to wash our meals down. We should've expected nothing less since there are no other covers and the wood burning oven can turn raw dough into smoky blistered goodness in around 90 seconds flat. The crust on both are chiaroscuro charred to black and golden blonde perfection with a hit of smoke and a crunch that gives way to the signature Neapolitan chew. So far, so good. 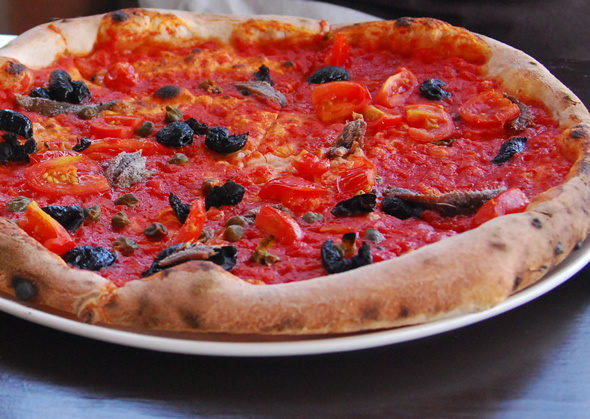 The Napolitana is text book anchovy pizza with plump, savory morsels of fish joined on a bed of bright, rich tomato sauce with a sprinkling of briny capers, and fantastic waxy black olives. I like the fact that since this is a seafood pizza the traditional layer of cheese is omitted for the sake of authenticity. It's hardly missed as the brightness and contrast are both cranked way beyond visible limits offering a full spectrum of salty, tangy, sweet. If you put your ear close enough to it I'm sure you could hear the ocean. In contrast, the Diavola (pictured at top) was a tasty juxtaposition of fiery, peppery heat from the salumi, pepperoncini and hot peppers; and soothing from the mellow milky buffalo moz oozing from each bite. Once again the cured black olives added a pleasant saline note to the mix for another winner. I know that the ownership at QMP are probably really tired of the comparisons to their west end counterparts and the good thing is their pizza offerings more than stand on their own. I know whenever I'm craving pizza and don't feel like the trek to Ossington , I'll definitely hit up Queen Margherita Pizza for a bite. You'll notice I've been very dipolmatico about this pizza taste-off. I know you're wondering: "But seriously, who's the winner?" Well that'd be whoever finds themselves lucky enough to snag a table at either of these fine pie joints, natch!